January 26, 2006 – A new FDIC online tool was released to help educate consumers how to better protect their computers and themselves from identity theft, and steps to take if they have been victimized. The presentation: Don’t Be an On-Line Victim: How to Guard Against Internet Thieves and Electronic Scams is on the FDIC’s website. 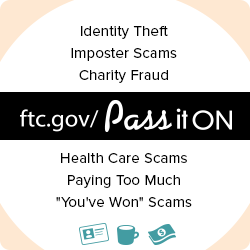 If you are a victim of identity theft please follow the steps provided on www.ftc.gov/idtheft. Standard Bank values your business and the privacy of your personal and account information. Standard Bank Associates will never request confidential information through e-mail and asks that you report any such requests to the bank immediately. Contact our Customer Care Center, Monday thru Friday from 9:00 a.m. to 4:30 p.m. at (412) 856-0352, to verify any requests for confidential information or to report any suspicious e-mails. What this means for you: When you open an account , we will ask you for your name, address, date of birth, and other information that will allow us to identify you. We may also ask to see and copy your driver’s license or other identifying documents.